For twenty-seven years, Josef had imprisoned and molested Elisabeth in his man-made basement dungeon, complete with sound-proof paneling and code-protected electric locks. There, she would eventually give birth to a total of seven of Josef’s children. One died in infancy—and the other three were raised alongside Elisabeth, never to see the light of day. Then, in 2008, one of Elisabeth’s children became seriously ill, and was taken to the hospital. It was the first time the nineteen-year-old girl had ever gone outside—and soon, the truth about her background, her family’s captivity, and Josef’s unspeakable crimes would come to light. 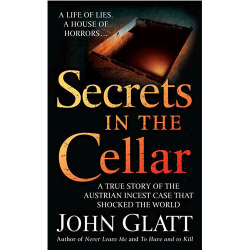 John Glatt’s Secrets in the Cellar is the true story of a crime that shocked the world.